Those nice cuddly wolves killed 19 elk on the McNeil Elk Feedground last night. They slaughtered 17 calves and 2 cow elk. The only thing they ate were the fetuses in the two cow elk. Don’t you Wolf Worshippers EVER try to again claim that wolves won’t kill for sport. That is a lie like the rest of the lies told in order to get these wolves introduced. 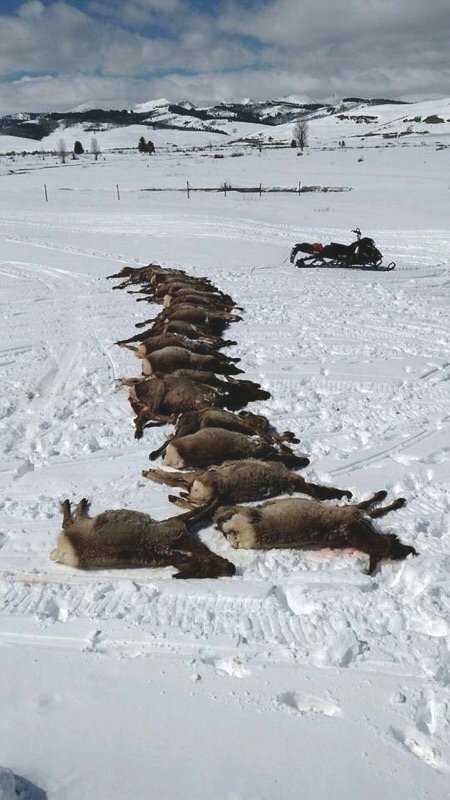 A pack of wolves that killed some cattle a couple of weeks ago and the US Fish and Wildlife Service shot 5 of those wolves from a helicopter, leaving 12 wolves in the pack. There is nothing that can stand up against 17 very large wolves in a pack. And when they decide to just kill for fun, the 12 remaining can do a lot of damage, as witness by 19 elk killed in one night by them. No definite confirmation of which pack killed them, Dell Creek Pack or Rim Pack. 19 elk killed last night, 2 of them cows, wolves only ate the fetuses. 3 other calf elk killed in the last couple of days. 50 elk previously killed in that herd in the last two weeks. Total about 75 killed in two weeks. That reduces the number of hunting permits by about 230 (30% success rate on licensed hunters killing elk, 75 elk killed; so that 75 elk could have been killed by hunters; 225 permits issued to kill 75 elk.) Lots of money down the drain to feed wolves. Strains GF budger.